now it's time for us all to realize that if we do not get the citizens themselves the management of the water in our hands, no one will save us! On 15th January, the Greek parliament voted a law to pass the 3rd evaluation of the Troika. Among others, the law includes the transfer of water companies (51%) straight to the Superfund. When the Superfund was created, the idea was that all public companies would be transferred to a holding company which would be a subsidiary of the Superfund. In fact, the new scenario is worse than the previous one. Just a day after the vote in parliament, TAIPED (HRADF) announced the update of its privatization projects, among them 24% of EYATH (water company of Thessaloniki) and 11% of EYDAP (water company of Athens). Since the 3rd memorandum, they had been talking about selling 23% of EYATH; which now has become 24%, leaving the public with only 50% + one shares. In September 2016, the Union of EYATH workers sued the Supreme Court for the creation of the Superfund and the transfer of EYATH to it. This case will be judged by the end of February. Now we are researching whether the 2016 action to sue is consistent with the transfer that will take place on 15th January or whether we need a new one! In Greece, resistance to austerity comprises a mosaic of struggles for a right to the city, conceived as the collective self-determination of everyday life. When talking about Greece and “the crisis,” it is easy to fall in the trap of “Greek exceptionalism.” After all, it is through essentializing orientalist narratives that austerity and structural adjustment have been justified: the Greeks are corrupt, lazy and crisis-prone, and they should be adapted and civilized for their own good. There is a flipside to the orientalist gaze, however, which ascribes extraordinary qualities to the other: the Greeks have a surplus of collectivism, revolutionary zeal or solidarity, which makes them more likely to organize and resist. Both these narratives prevent us from seeing that the conditions that brought about the “Greek crisis” are prevalent in many parts of the world, that capital is moving towards policies of exclusion and dispossession even in the capitalist center, and that resistance is not the prerogative of southern peoples, but will soon be the only reasonable response even in the north. In fact, the “Greek crisis” is neither “Greek” — since it is only a symptom of the shift of global capitalism towards a new regime of accumulation based on shock and dispossession — nor is it a “crisis” in the sense of an extraordinary event. Instead, it represents a new normality that threatens to shake the very foundations of social coexistence. Nevertheless, Greece has been a privileged spot for observing how this global paradigm shift plays out within the boundaries of a single nation-state. Greece is being forced to privatize its two largest water companies in Thessaloniki and in Athens. This arouses big outrage and resistance is growing. “The access to water is a human right. Water is a public property and not an object of trading.” This appeal signed by almost 2 million people induced the EU to give up the plan of water privatization - except for its southern countries, where the policy of the Troika puts pressure on politics to privatize water supply. So the Greek Parliament had to agree in transfering the large water companies EYDAP and EYATH to the newly founded superfund, controlled by the creditors, for privatization. Otherwise they would not be given the next credits. SaveGreekWater has participated in the 2-day work meetings of the event «Fighting for Water Democracy in the EU following the right2water ECI» organised in the European Parliament by the Independent MEP Sofia Sakorafa with the support and presence of MEP Lynn Boylan from Ireland, MEP Stefan Eck from Germany and MEP Joao Pimenta Lopez from Portugal. 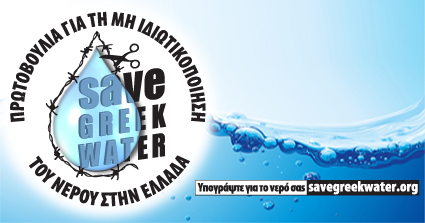 In the context of this event and as part of its actions in tackling water privatization in Greece, SaveGreekWater announced the deposition of an official request to the European Council for disclosing any information relevant to the transfer of water services at the new privatization superfund (H.C.A.P.) dated after the 1906/2014 decision of Greece’s Council of State which had judged as unconstitutional the privatization of water services either by stock percentage or by management privatization. According to European Law, the European Council is obliged to answer to this request in 15 days. It is worth noting that any pressure to privatize water is in violation of the article 345 of the EU Treaty and it is furthermore contrary to the suggestions of the European Parliament’s resolution that urges the European Commission not to push the countries under financial programs as to this matter. After the voting of the transfer of EYDAP and EYATH to the Superfund which was established under L. 4389/2016 the two major Greek water services are privatized in violation of the Constitution, despite the reassurances to the contrary. With this press release, SaveGreekWater attempts to investigate the consequences of the to-be-approved multi bill, on the Greek water services EYATH and EYDAP. As John Locke, one of the Enlightenment founders, so our initiative believes that “the actions of men are the best interpreters of their thoughts”. After addressing this quote to those in power as well as to those who should control them, we consider it our duty that one of our “actions” should be to inform our fellow citizens. In an effort to pierce through the uproar of misleading screaming voices and shifting of focus which constitute nowadays the greek “public sphere”, with this press release, we attempt to investigate the consequences of the to-be-approved multi bill, on the Greek water services since EYATH and EYDAP are both mentioned in an article in appendix D of the bill which establishes, among others, a “Super-Fund”, entitled “Hellenic Company of Assets and Participations S.A. (HCAP). In the draft of the bill (Article 198), EYATH and EYDAP appear among those publicly controlled companies which will be transferred in their entirety to EDHS (“Company of Public Paticipations S.A.”) within “a next period of time”, with EDHS being founded at the same bill and described as one of the subsidiaries of the new “Super- Fund”. Greece will vote for a new government this week. These elections are a great opportunity to reverse years of austerity and unfair measures imposed over Greek people by the Troika. Among those measures, the privatization of water services, challenged by a great mobilization of Greek civil society and now blocked by justice. Despite the international scaremongering campaign run by the supporters of the Troika, the European Water Movement calls on all social movements and civil society to stand up against this interference. The Greek people are sovereign to choose their own government and those parties that oppose austerity and want to run policies based on principles of social equity, focused on people's rights and the defense of the public and commons. The European Water Movement also calls especially on those candidates that have campaigned for the Human Right to Water and against privatization of water in Greece and at European level for accomplishing with their position statements. The approach and recognition of the water (and in general, water supply and sanitation) as a commons, a social good and a fundamental human right or vice versa, as a commodity and / or as a means for taxing citizens determines the policy management: private, public, social, based or not on democratic participation of citizens and workers. The results of the private management of water, which is applied worldwide, are now known: degradation of water quality, increased water loss, deterioration of infrastructure and increasing prices. The results of the public or social or public-community, based on cooperation between public and local and regional bodies, cooperatives, trade unions and other collectives of a community are also known: accomplished citizen involvement, strengthened quality water services and lower prices. Catapult against HRADF (Hellenic Republic Asset Development Fund) is the decision of the Athens Court on the injunction application asked by "Citizens Union for the Water", a secondary level Union of Thessaloniki Water Cooperatives, set up by the Initiative K136, to claim the 51% stake in EYATh in the name of the citizens of Thessaloniki. Three times we asked - via the lawful route - information on the process and criteria by which the HRADF excluded the "Citizens Union for the Water" from the second phase of the tender for the privatization of 51% of EYATh. HRADF flatly refused to give any information or data, arguing that it is "private company" and is not required to give anything. The third time, the Union appealed to the Court of Athens for injunctive relief. We currently publish this decision by which the Court of Athens requires HRADF give to the Citizens Union for the Water all the requested data, rejecting the complaints on the company's "private law". -- The HRADF at the recent meeting with representatives of the referendum organizers, said that does nothing by itself, but that the government said. So the question is what the government will do after the referendum, which has not yet clarified its stance. Hence, the issue of privatization has not ended, instead remains open. Divest a minority shareholding. To sell that as much as 24% to a "strategic investor" transferring the management too. In this case, the strategic investor will undertake the management of the company but the Greek government will retain control. Disposal of shares (again up to 24%) through the stock exchange and the government retaining the management. Return the entire amount to the State by cancelling not only the sale plan, but also the investor entry. Since the beginning of the disclosure of the government’s intention to privatize water services, throughout the changes in leadership in EYDAP and TAIPED until a few days ago, a struggle with the use of law and logic was given against the enclosure and grabbing of the collective good of water. After almost three years, the citizens who signed the European Citizens ‘Initiative, these who were informed and passed this information to others, all those who formed a proper and documented opinion about the risks of privatization through our arthrography, argumentation and campaign, the citizens’ movements in Thessaloniki and the county, we can all, without exceptions, feel proud of the first major victory which was won by the citizens united. Watching closely during all this time the legal proceedings of the case of the residents and associations recourse to the Council of State and thinking how could we help in this effort, we never stopped all this time to contribute voluntarily, yet with professionalism, in this “unequal” race of informing people and creating alliances in Greece and abroad, with the help of alternative media, newspapers, radio and media abroad. This campaign in favor of rationality and documented reasoning, qualities that are both missing from the public dialogue, was successful in shaping a trend against privatization formed by the beliefs of the majority of the Greek people as expressed not only in polls but also by the overwhelming 98% “NO to EYATH privatization” of the referendum of Thessaloniki. We believe that this trend is reflected in the decision of the State Council at its highest level, which is its plenary session. The referendum for the privatization or not of EYATh (Thessaloniki water and sewerage company) held in Thessaloniki on 18 May 2014, is a golden page in the history of the city. The idea was initiated by the EYATh Workers Association in 2011, visited the municipalities of the city, discussed the proposal and asked to take decisions against the privatization of EYATh and in favor of a referendum. In March 2013 the EYATh Association of Workers invited municipalities, organizations and citizens of Thessaloniki, for the establishment of a great alliance against the privatization of EYATh. Municipalities of the Thessaloniki area, Initiative 136 (K 136), the Citizens' Union for Water (second-level union of water cooperatives) and the 12 non-profit water cooperatives were co-founding members of the coordinating body. The coordinating organizations and citizens during the 2013 restored the proposal of the Workers Association since 2011, for a referendum on the water. The decision was finally at a meeting on February 17, 2014. More than 1500 volunteers set up ballot boxes outside the 192 electoral centres of the 11 municipalities of Thessaloniki’s metropolitan area, at the same time as the municipal elections taking place inside. Numerous groups and citizens’ initiatives worked side by side to carry out the plebiscite, with the infrastructural and moral support of the 11 municipal councils. A few volunteers, intimidated by the government’s threats to arrest the organizers for "obstructing the electoral process", failed to show up, however the coordinating groups moved people around quickly and covered the vacancies. There were minor incidents, with some police guards refusing to hand the ballot boxes to the organizers, but legal counsellors intervened successfully in all cases. 218.000 people cast their vote, about 34% of registered voters. Compare this to 55% of registered voters who participated in the municipal elections. About 60% of those who voted inside the electoral centres also voted in the referendum. Had the ballot boxes been inside the schoolyards, in central easy to find places, this figure would have been much higher. Unfortunately the government disregarded the organizers’ call and banished them from the yards. 98% of the vote was for “NO” to privatizing Thessaloniki’s water and sewerage company. Yesterday (17 May 2014) the Greek government, through a circular by Minister of the Interior G.Michelakis, declared "illegal" the self organised water referendum threatening the organizers with arrest for "obstructing the electoral process". The volunteers behind the referendum that was announced in a public meeting of the grassroots movement SOS te to Nero while the right2water European Citizens initiative hearing was being watched 17 February 2014, have announced that they will go ahead risking arrest by the police. The 11 local mayors on the metropolitan area are supporting the referendum and denounced in forceful terms the attitude of the government. The attitude is a stain on the Presidency of the European Union, priding itself being the cradle of democracy. The referendum asks the people of Thessaloniki if they want the local water company EYATH to go into private hands. Greek government and French multinational Suez Environment asked to respect outcome. Thessaloniki is a lively sprawling metropolis located in the north of Greece. As with the rest of the country, it is affected by increasing unemployment and poverty, a result of the government's Troika-dictated policies, which have driven the economy into a deep recession. In Greece, as in many other countries in the past, disaster capitalism has utilized the sovereign debt crisis -that it also helped produce- as an excuse to push forward an aggressive campaign of neoliberal plunder: Attack on the populations' social, political and labour rights, dismantling of the health and education system, massive dispossession through mega-mining projects, and privatisation of everything that constitutes the public wealth. Again, as in many other cases, the government and the media are mindlessly repeating neoliberalism's favourite mantra: "there is no alternative". In this context, as part of the terms of the loathed "memorandum" imposed by the IMF, in 2011 the government announced its plans to privatize EYATH, the state-managed company providing the city's 1.5 million inhabitants with water and sanitation services. Suez, the water sector giant, was quick to express interest in profitable EYATH. As of May 2014, the privatization process is underway, and two bidders, French Suez and Israeli Mekorot, have advanced to the second phase of the public tender.